Type 180 words per minute and have fun with lot of Cute Icons, Text Arts and even Cool Text Styles in your message. It's a SUPER Fast and Fun way to share your message with friends from a huge centralized Library of Symbols, Text Arts & Text Clips! 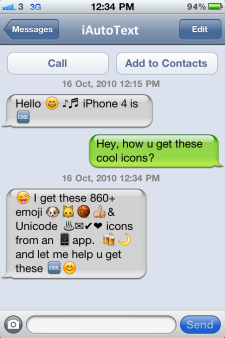 Enable 450+ emoji icons for iOS. 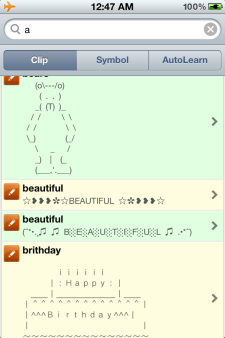 Input the emoji icons by a Global Emoji Keyboard in any Apps. 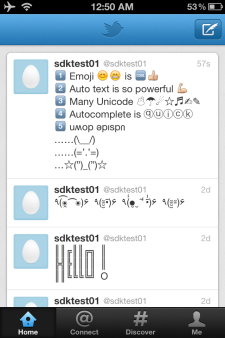 Input 600+ unicode symbols from a user-friendly symbol keyboard. 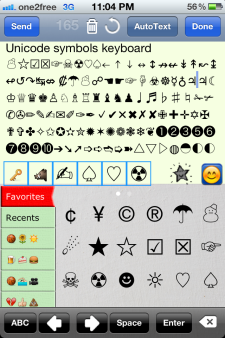 Assign favorites level to Emoji and Unicode Symbols, access the symbols instantly in the favorities list. Frequently used icons can be input directly with Text2Emoji. e.g. Type :) and it will automatically convert to a smiley icon. Suggest list of words from your freqently used words when you type. In general, there is a limitation of words a person knows in his vocabulary. Actually, we always type the same set of words and thus our AutoComplete feature can accurately suggests what you want to type. Type faster using abbreviation shortcut which converted into long text snippet. You can create a library of abbreviation shortcuts for text clips that you use frequently, such as addresses, standard replies, chat shorthands, text arts and symbols. Type the shortcut and Tap AutoText, it will automatically expands to the full text clip or the symbols. 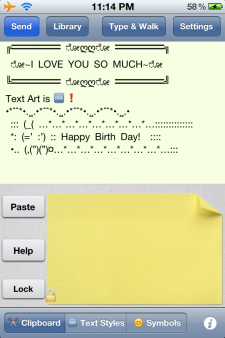 Text Arts in Library for your Fun status update in Facebook, Twitter,SMS, Email etc. Cool facebook & twitter update with our 10 cool textsyles, like upsidedown text and buttble text. Typing in a transparent viewport and help you avoid obstacles when walking. 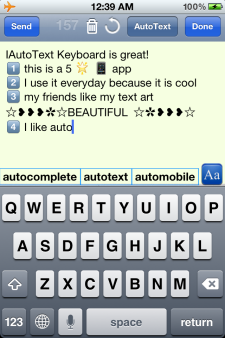 "iAutoText Keyboard is one of the most polished Apps I have come across! It save me a lot of time and FUN, what more could you ask for?" "If you do a lot of typing in iPhone, you're crazy if you do not have iAutoText Keyboard in your iPhone!"